Nicole Richie's Ice Blue Classic City and More! Nicole Richie was spotted heading to the pool at her hotel in Miami, FL on March 20, 2012. In her hands is an Balenciaga Classic City in Ice Blue from 2005. We can notice that the bag has faded to an off-white which is common for this particular color to fade and yellow. It doesn't matter though because even after all these years, Nicole still carries hers once in a while! Ashley Tisdale was spotted catching her flight back to Los Angeles from windy Maui, HI on March 23, 2012. She carries her gorgeous S/S 2011 Nuage Rose Gold Giant City (my fave!) and wears a beautiful Ikat dress by Allsaints. The Jenner sisters were spotted arriving at the Los Angeles Lakers game on March 23, 2012. Kendall carries her Balenciaga Black Classic City as her choice of bag for the sporting event. Minka Kelly's Sapphire Day and Mena Suvari's Polkadots Maxi Twiggy! Gorgeous Minka Kelly was spotted grocery shopping in Beverly Hills, CA on March 21, 2012. She wears her lovely 2008 Sapphire Covered Giant Hardware Day bag. She's also sporting tie-dye jeans by Earnest Sewn which seems to be a huge trend for this spring! Actress Lisa Rinna arriving at the Kate Somerville Skin Care Center in West Hollywood, California on March 20, 2012. She sports a casual chic look in all black and carries a gorgeous Pewter Hardware Twiggy. 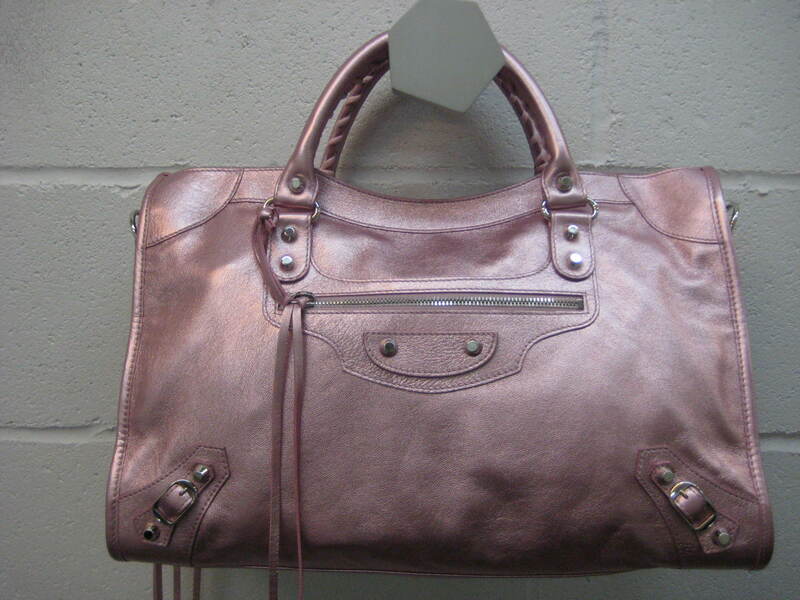 I wish Balenciaga would introduce this discontinued hardware again.. it's stunning! 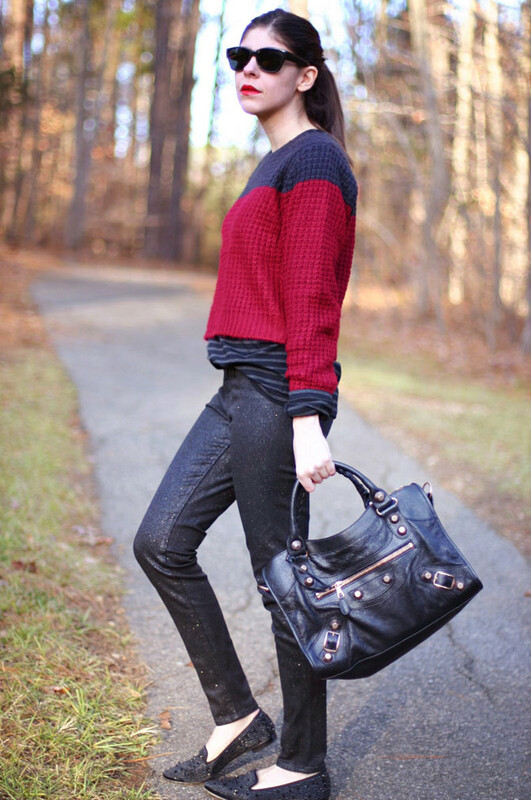 Lovely Vale, writer of Fashion and Cookies, shows off her beautiful Classic Work bag. Please check out her blog for more beautiful photos! Beautiful Bettina, owner of blog Neat Bit,wears her lovely Anthracite Rose Gold Giant City bag! Check out her personal blog for more great photos. Exquisite Erika Marie from Fashion Chalet shows off her gorgeous Rose Gold Giant City! Visit her blog for more great pictures! Sydney looks lovely carrying her 2009 Sanguine Classic First as her weekend bag! She hopes to add a City to her collection soon. For her birthday, reader Mavis was surprised with a gorgeous Balenciaga bag shaped cake by her best friend. Please check out her cake shop's website Sweet Scrumptations for more amazing cakes! Mavis and her beautiful Rose Gold Giant Work! 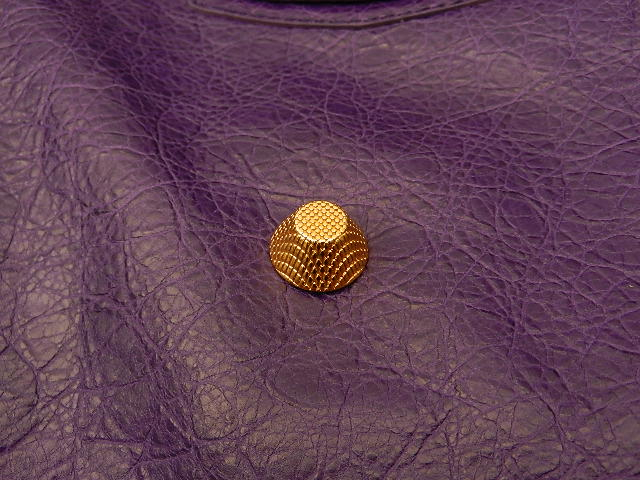 It looks like the Balenciaga boutiques in the US is receiving a limited edition S/S 2012 Dark Violet City with the highly missed Giant Gold Hardware. I spoke to Bill from Balenciaga New York and he says they are due to receive the Giant City sometime in April. Unfortunately he did not mention any other styles for the Dark Violet GGH. The price will be $1895. Please email him at balstr001.newyork@us.balenciaga.com with Attn Bill in the subject line if you're interested in putting your name down. He does not have any pictures yet but I posted a pic below of a swatch. He also told me about these really pretty Limited Edition Metallic Cities! They are exactly like the Metallic Cities from F/W 2005 with shiny nickel classic hardware. Below are pictures of a metallic light pink and a bronze. These are priced at $1545 which is not too bad on the wallet. Please email Bill if you're interested. ETA 4/15/12: Here are some pictures of the G21 (Giant Gold Hardware) and G12 (Mini Giant Gold Hardware) Dark Violet City. I have to say that that the GH still captures my heart because the hardware is so bold and beautiful. Singer Alanis Morissette was spotted enjoying a sunny day with husband Mario Treadway in Santa Monica, CA on March 2, 2012. She sticks with comfy Balenciaga flats and carries a gorgeous tricolor Givenchy Antigona tote! Miley Cyrus was spotted leaving a Pilates class in West Hollywood, California on Wednesday February 20, 2012. She carries a gorgeous yellow Celine Luggage tote and wears her lovingly worn Balenciaga flats as well! Kristen Stewart continues her trip in France and was spotted exiting her posh hotel in the French capital city on Friday night (March 2). She's been wearing her Balenciaga quilted leather jacket for 3 days in a row! If it looked that great on me I wouldn't take it off either! Kristen Stewart takes her casual grunge look to a whole new level! She was spotted getting lunch at Le Duc after attending the Balenciaga 2012-2013 Fall-Winter fashion show (today). I guess the greatest perk of being the newest face of Balenciaga's upcoming fragrance is dibs on goodies like the beautiful quilted leather motorcycle jacket she's wearing! I think this jacket looks very flattering on her which is nice because the bold shoulders do not work for everyone (like me). Just wanted to share a few gorgeous celebrities decked out in Balenciaga arriving at the Ready To Wear Fashion Show today, March 1, 2012 in for Paris Fashion Week Paris, France. 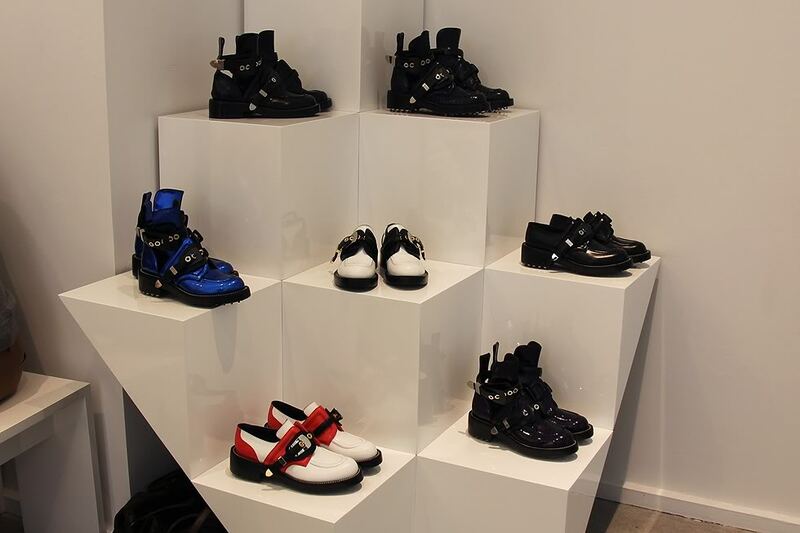 Here's the video to the show on Balenciaga's home page. Kristen Stewart who will be the new spokesperson for the upcoming Balenciaga fragrance wore a pretty blouse and jacket by Balenciaga. Salma Hayek arrived wearing her Balenciaga leather biker jacket and croc Envelope Clutch! Clemence Poesy rocking her Balenciaga leather biker jacket, Classic City bag and studded cutout boots! Better pic of boots here. The lovely Charlotte Gainsbourg arriving and taking a few photos..